Yesterday was perfect. I arrived home the same time as Varen (he'd been out shopping to get the missing ingredient for last night's dinner) and we got to 'hang out' in the sunshine for a while :) We let the bunnies run around we chatted about his trip and life in general and our plans and goals for the future. I popped out to go to gym and Varen had a little bit of a snooze. Silly boy is going back to work today after they phoned him yesterday. Shame, but I don't think he quite knows what to do with days off and no one else around (and no dstv, haha!) :) So he made dinner last night (I was going to, but I'd picked a longer-to-make, only an hour or so, meal for him to make on Tuesday evening since I thought he'd be home all day), a delish Mexican mince with Polenta Cobbler. It worked out really well actually :) So we ate dinner, drank some red wine and watched The Butterfly Effect. I remembered really enjoying this movie when I first watched it so like with the others I've been watching lately I was curious to see it again. It's still and interesting movie. Hectic tho. I know this is a movie with multiple alternate endings, the one we watched last night had "The Open Ending". Oh, I forgot to mention yesterday that I was amused by some cameo's I noticed in the movies I watched on the weekend. I spotted one of Meredith Grey's first roles, I'm sure, in Catch Me If You Can. I also loved Bones' cameo in My Sister's Keeper. And this morning Varen was off to a new start, I was so impressed when he managed to drag himself out of bed just after 5am and off to gym. He was home again just as I was getting out of the shower. I can't quite explain why, but I really like it when we're both up pottering around at the same time in the mornings. I'm weird like that, but it made this morning a good start for me :) Things feel back on track. That dinner sounds awesome! 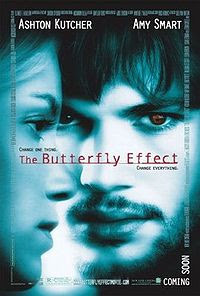 I loved butterfly effect also...but as you say.....it's a bit hectic! !